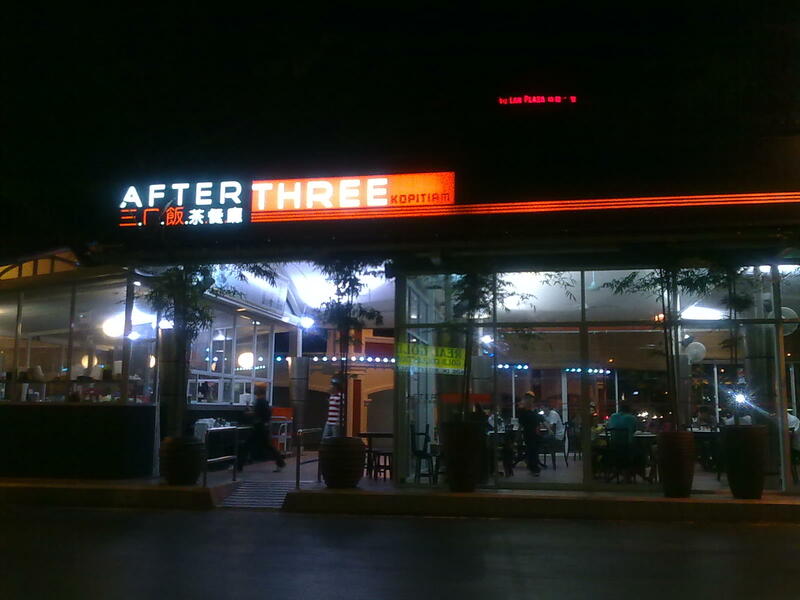 I was invited for dinner at this relatively new place in Miri. Food was generally acceptable, palatably speaking. and decided on the taro sweet corn banana split. Since I don’t like sweet corn, I asked the waitress whether I could substitute the sweet corn with vanilla. She nodded in assent. 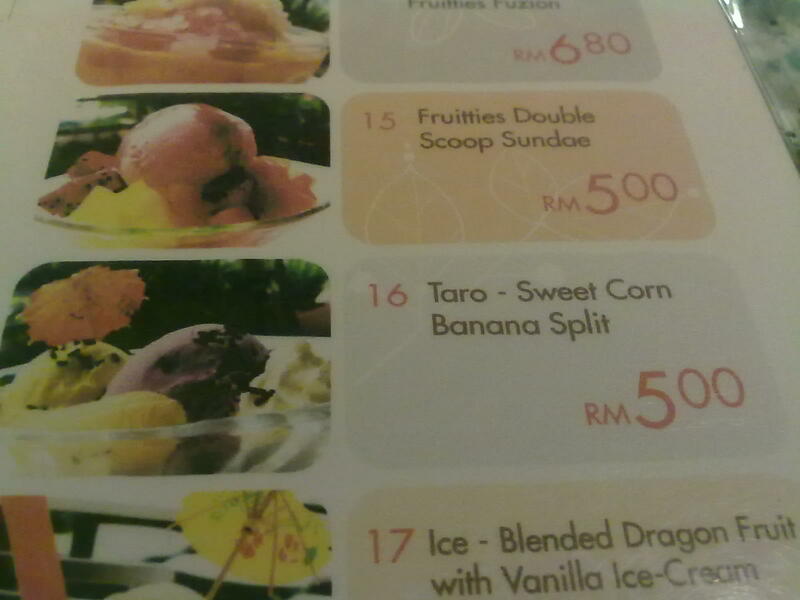 My host, on the other hand, decided to stick to the original taro sweet corn banana split. Seconds later, she came back to inform me that they’d run out of taro or in her own words “No more taro”. “What other flavours do you have?” I ventured. “Vanilla and sweet corn”, was her terse reply. “Two vanillas for me and for my friend, one vanilla and one sweet corn”. By then, I was a bit annoyed. “I thought you said you have no taro”. “We have,” she corrected herself. “Alright then. One with two vanillas and the other a combination of vanilla and sweet corn”. When she returned minutes later, I was given this. I know what you’re thinking. Where’s the taro? I got two vanillas and my host friend, two sweet corns. I could have kicked up a fuss but it wasn’t worth it. 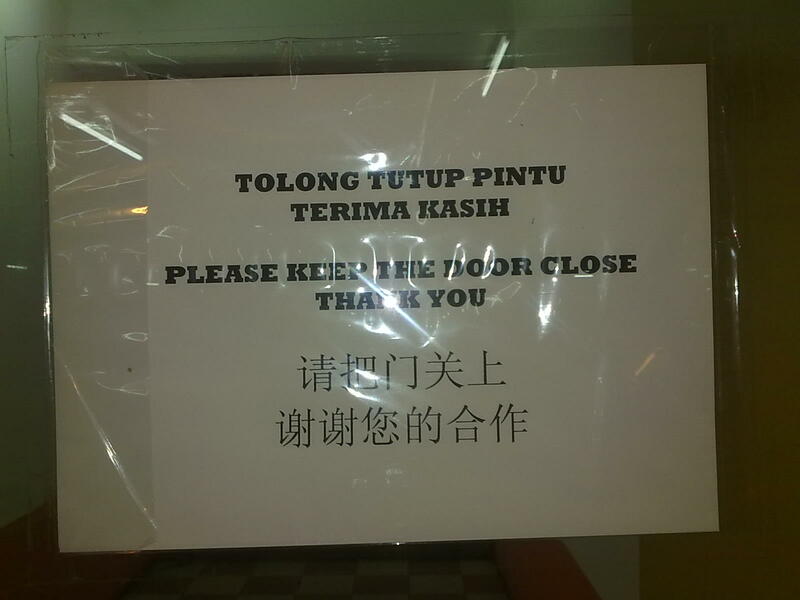 Moral of the story: Scrap the name taro because most of the staff have no idea what taro is. There is a possibility that some just assume it to mean banana split. 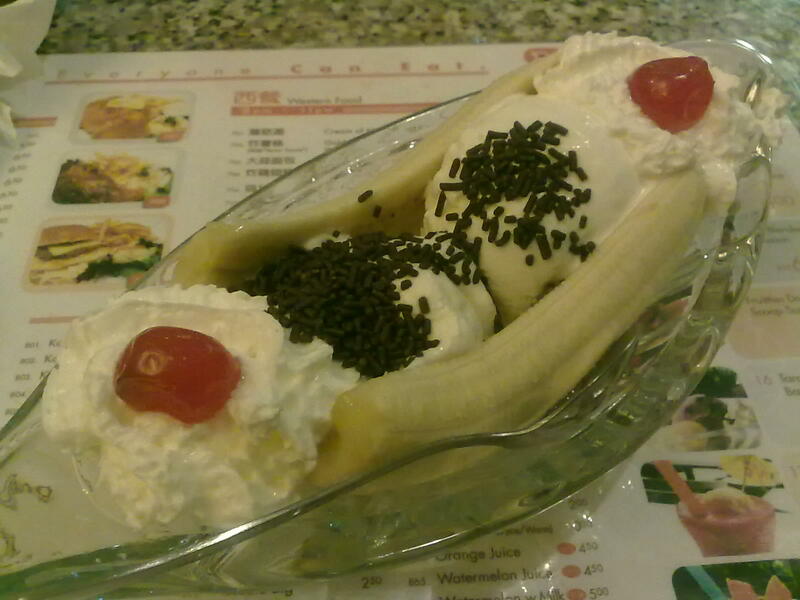 Hence, just stick to plain old banana split with a choice of 3 flavours (or more) in the menu. One of the features of communicative language teaching is the use of authentic texts in the classroom. This includes utilising a host of materials which you can get outside the classroom. What if these so-called texts are peppered with grammatical errors? Aren’t we as teachers guilty of perpetuating the errors? Am I to stand close to you at all times? 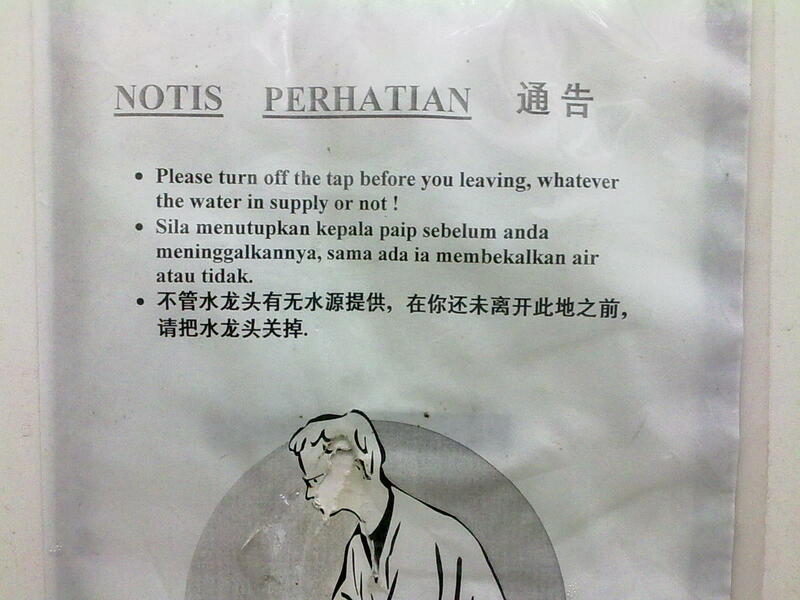 It was a time where grammar can be dispensed, eh? 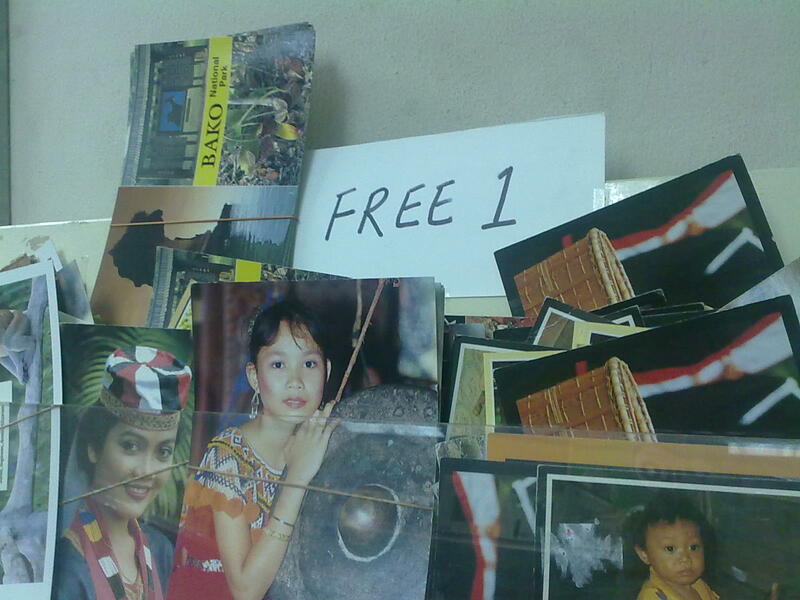 It has been quite a while since I last blogged. And the reasons are numerous but none is worthy of mention. Anyway, something caught my attention this morning when I went shopping. 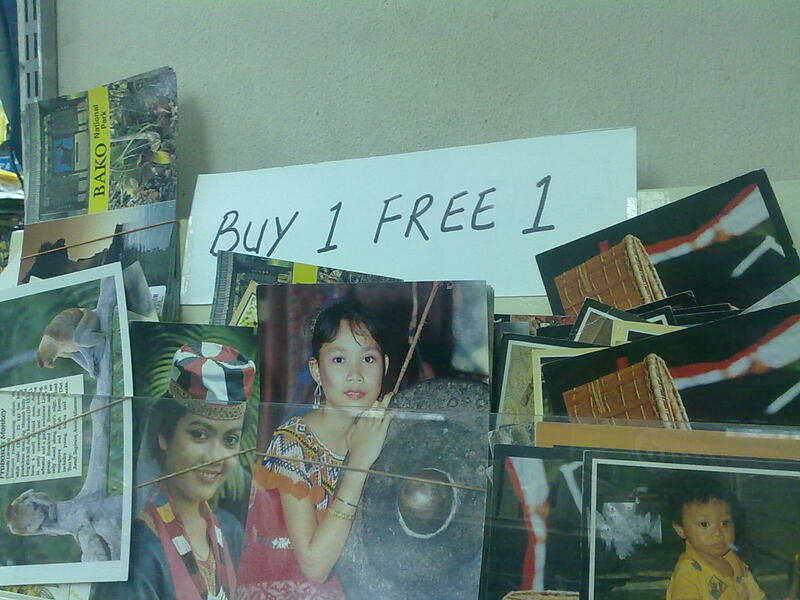 I saw this tempting sign, and it sort of beckoned me to take one. Moral of the story: Behind every card lies something more than meets the eye or as the Malays would have it “Ada udang di sebalik batu” (Loosely translated as There’s a prawn behind the rock). Hubris had got the better of you. Securely locked in their hearts. You and me in some small way? “Ah…teacher will cane you if you don’t behave” is an oft-used threat uttered by parents to make sure their children toe the line of decorum. Perhaps it’s time to put this to rest for canes are now reserved for disciplinary teachers and principals. Equating teachers with canes is a great injustice to the profession. My mom who used to work temporarily as a teacher never once used the cane on her students, though she brought it to class. And she instilled in me the need to establish rapport with the students and not fear. 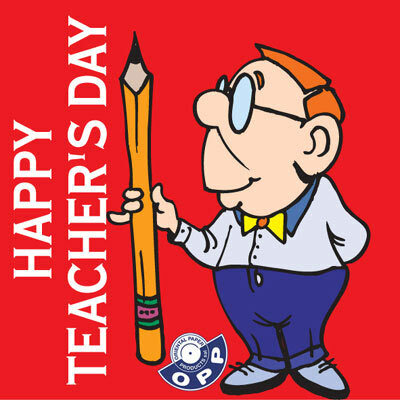 To all teachers who believe in the power of touching lives by words and deeds, we thank you. For those who once wielded the canes, hmmmmm…. I got this lovely booklet from the participants who attended my Workshop on Bible Knowledge last Saturday. In this booklet, there are wonderful poems on how teachers ought to view their students and themselves. I love all of them but I’d like to share one in particular with you. He knows the subject well, Lord. His grades are very high. and I’m sure that you know why. this fellow’s filled with pride! in almost the same fashion. would be to act like you. This poem reminds me of what my teacher told me when I did my temporary teaching in my former school. She said students can bring out the worst in you and it’s so easy to react unkindly. But the call to be a teacher requires one to be patient when those occasions arise.